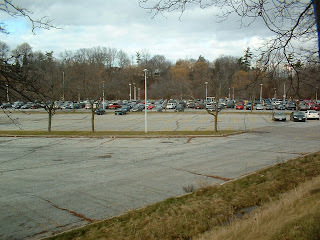 Less driving to McMaster campus; what will the future of parking look like? Note total trips by automobile are 39%. In the 1960s projections were that by 1980 54% of people would be arriving by car, so a significant shift of 15% away from car use. Shifts in transportation choices and options continue to be discussed, with McMaster's Institute on Transportation and Logistics working on a Transportation Demand Management plan for the university that was initiated by volunteer group Transportation for Liveable Communities (TLC). With media reporting the news that Hamilton will likely be getting a light rail system (LRT) -- with McMaster the western terminus of this high-order transit system -- all indications suggest opportunity to make future reductions in single occupancy vehicle use, opening up campus space for better uses than storing cars for a few hours a day. From our perspective, this is the trajectory that leads to more natural space in west campus for research and recreational opportunity. MITL is working with McMaster University Security and Parking Services to assess the current state of the University’s collective transportation strategy/situation including its parking capacity and will then develop a sustainable, adaptive and inclusive Transportation Demand Management Plan. Transportation Demand Management (TDM) is a general term for various strategies that increase transportation system efficiency. It gives priority to more active and/or sustainable modes such as walking, cycling, ridesharing and teleworking; particularly so under congested conditions.